The Original E-11 Stormtroper blaster made by ILM for the movies was built from a British Sterling Sub-machinegun (used mainly in World War 2). 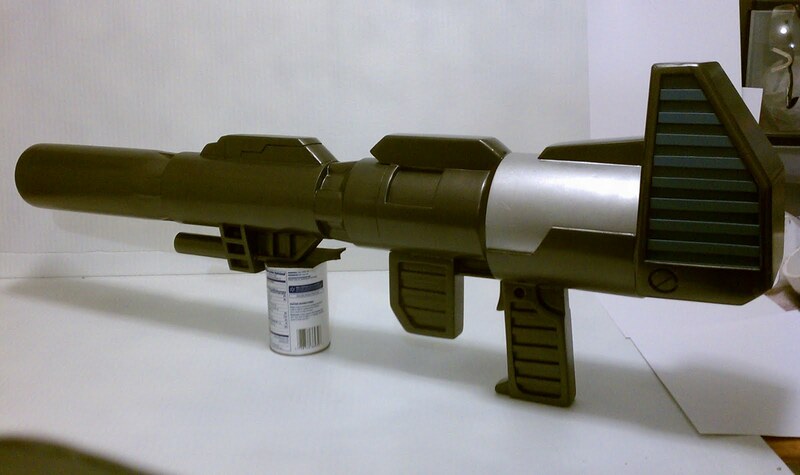 Other bits and pieces were added to the body o the gun …... These heavy blaster rifles were carried by stormtroopers when they needed more firepower in the field. Bounty hunters also favored them for sniping jobs. Their durability made them ideal for use on far flung outposts in inhospitable environments like Tatooine. They were equipped with bipods for steadier shooting as well as a folding stock. Free Download, 3d Star Wars™ DC-15s blaster rifle model available in obj, stl and made with SolidWorks 2010-15-16.... The DC-15A blaster rifle was a long ranged and powerful blaster rifle. It was produced by BlasTech Industries for the Grand Army of the Republic . It was carried by clone troopers and shared many similar traits with its smaller cousin, the DC-15S blaster carbine . The DC-15S was the blaster carbine variant of BlasTech's DC-15A blaster rifle. This weapon was carried by the clone troopers of the Galactic Republic during the Clone Wars. It was also in service in the earlier years of the Galactic Empire. how to draw cairn terrier easy DC-15A Blaster Rifle Manufactured by BlasTech Industries, the DC-15A is a tibanna gas, cartridge powered weapon. Hyper-ionized blue plasma bolts are more than capable of penetrating armored units. 28mm DC-15A blaster rifle legion Scale Remember to Post a Make! Remember to come back and post what you've printed as Make. They're armed with Phrik versions of Cap's shield, slugthrower pistols identical to Cap's M1911, DC-15A blaster rifle (holstered on the back with/instead of shield) and two thermal detonators. They're wearing a Plastoid weave version of Captain America's First Avenger uniform (whereas Cap Prime wears a Cortosis-weave Winter Soldier variant). This is one of my best looking Star Wars builds and I hope you enjoy! It took about 3 hours to build and i sort of made it a combination of the one from the movies and the one from the Clone Wars cartoon.